Ice sculpture by Okamoto Studio. Photo courtesy RESOBOX Gallery. Saturday, August 15 from 8:00 p.m. until 10:00 p.m.
RESOBOX Gallery hosts a one-day Japanese sake party and ice sculpture exhibit featuring the work of New York-based artist collective Okamoto Studio. There is a reception with sake and music on Saturday, and the gallery will remain open all night long to view the sculpture as it melts and turns into something even more unique and beautiful. Okamoto Studio thrives on taming the complexities of ice to create the desired experience. This means careful execution of details that are seen as crucial for the success of each piece. 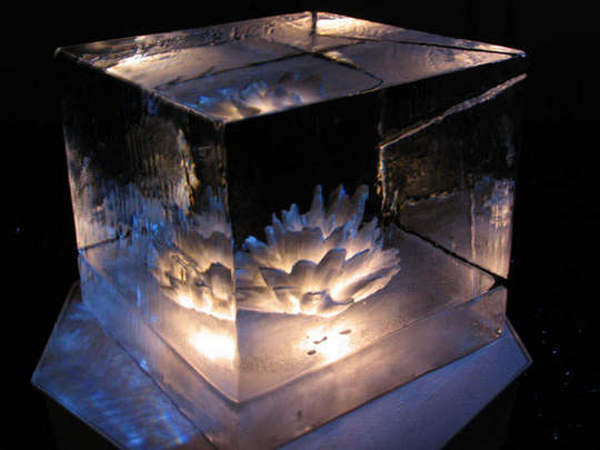 Finely sculpted ice is only half the game; they also give deep thought to presentation strategies by offering ideas for placements, changing designs based on the duration of the display, and custom-building trays with uplighting set within. For more information, please visit RESOBOX’s website or the Facebook Event page.